Hi there. I just got back from some Thanksgiving traveling. I drove all the way up through the state of Texas and into Oklahoma for the very first time! The clouds were looming and there was a rain storm and it was thrilling. I’d thought I’d share some of my favorite homemade holiday gift ideas in the next few weeks, since it is easy to become inundated by so many “things” this season. 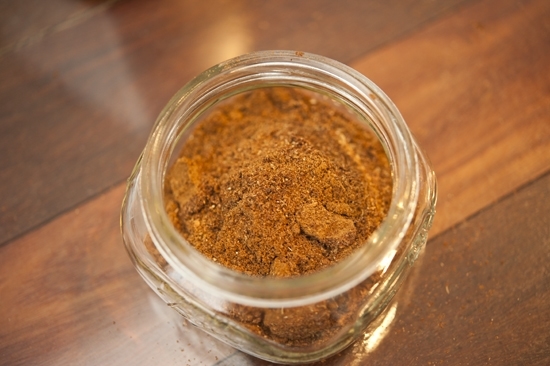 This is a spice blend that I love because it is so versatile and adds intrigue to just about everything. 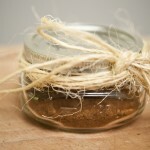 Plus it is the kind of thing you can make last minute if you have a sudden party to go to and need a hostess gift. A sudden party… isn’t that what life is all about? 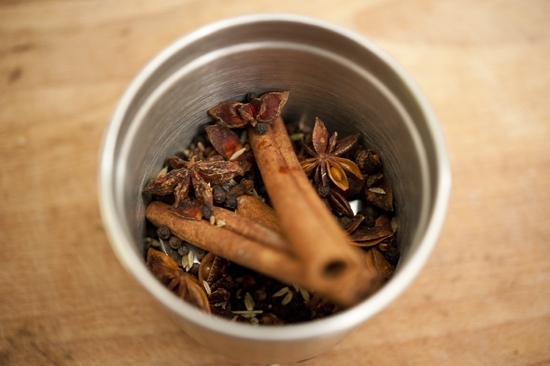 You will need: Fennel seed, star anise, black peppercorns, whole cloves, cinnamon sticks. It is best to start with whole spices here rather than pre-ground because it really affects the freshness and power of the flavor. 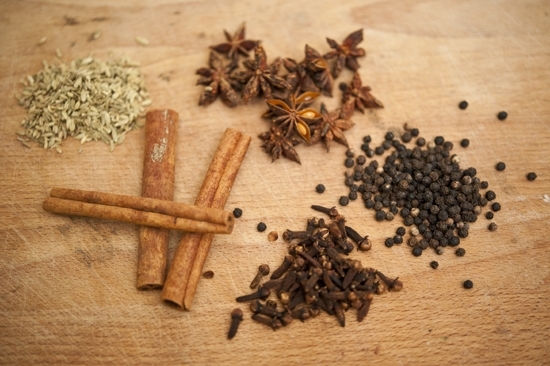 Toss all of these things into a spice grinder. Or coffee grinder in my case, washed of all of its coffee grinds. Give it a nice blitz until it is all turned to a powder. Like so. 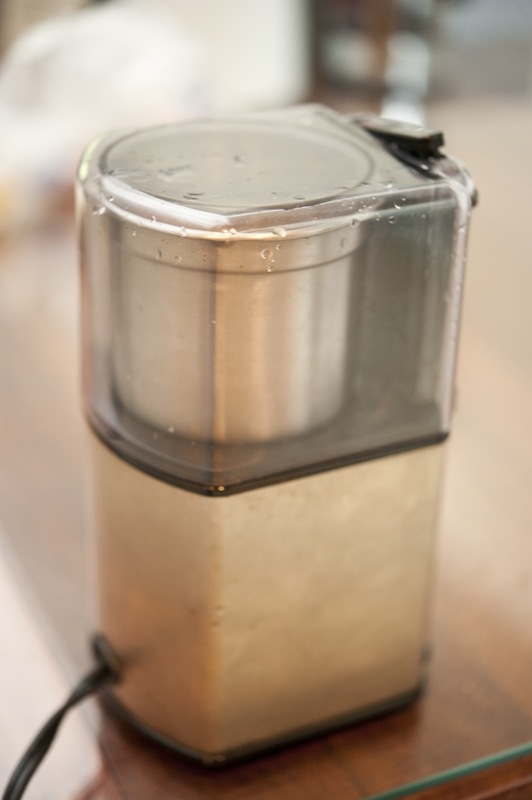 The cinnamon sticks may pose some problems depending on the strength of your grinder so you may want to break it into smaller pieces before adding it to the grinder if it seems to be giving you trouble. 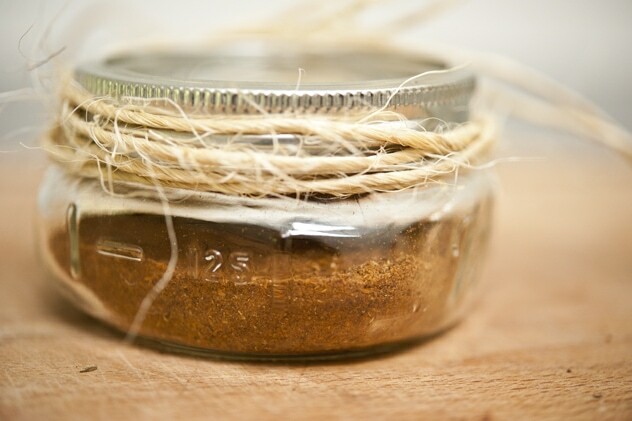 Transfer it all to a nice glass jar. You can get creative with what you present it in. I bet a craft store would have all kinds of interesting small jars. Voila! You have your gift. I sprinkled some of this on some orange wedges for brunch recently and it was a big hit. It adds instant excitement to things. 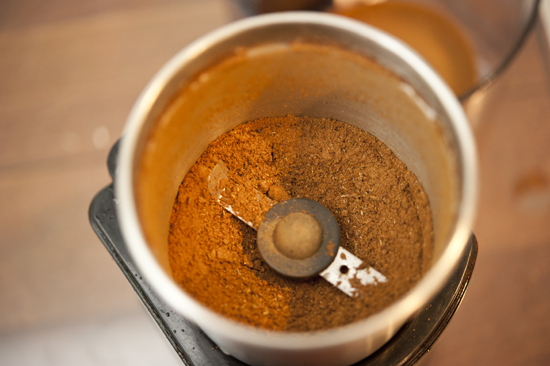 Combine all ingredients in a spice blender, coffee grinder or food processor and blend into a fine powder. 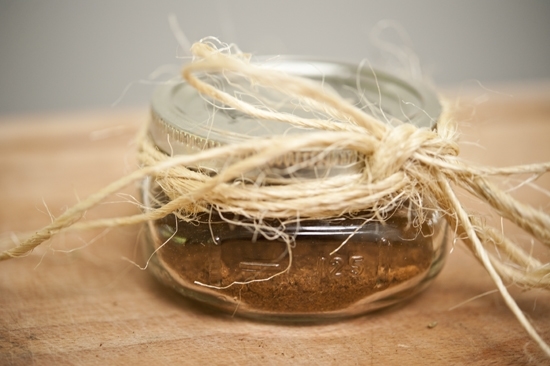 Store in an airtight container or a small glass jar with a tight-fitting lid. Sprinkle the blend over orange wedges or ice cream, mix it into tea or coffee, or add it to your favorite baked good. Wonderful! I did a 5-spice chicken recipe earlier this year and I bet making homemade powder would take it to a whole new level! just one more reason I need a coffee grinder! lol…….this sounds fantastic! I can just smell it reading your post! I need a coffee grinder too! I bet this would be delicious in apple cider, it look so good! The best gifts are homemade, intiguing, original and extra tasty – this hits all the high notes and I will be making some up – to give away and to cook with – thanks for the inspiration. Do you by chance have this recipe if you don’t have a grinder. I am really interested in making this. I have been looking for this spice since I ran out of my purchased blend and so happy I found a do it yourself blend. I will let you know how it comes out..